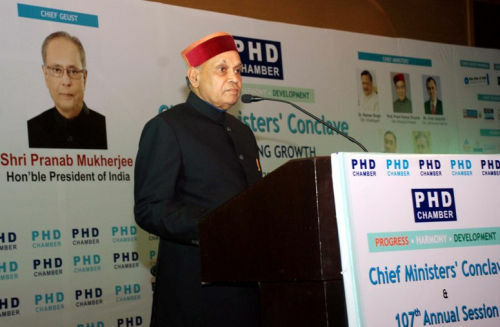 Chief Minister Prem Kumar Dhumal stated that his Government was committed for the welfare of employees keeping in view important role being played by them in effective implementation of policies and programmes of the Government. He said that State Government had given financial benefits of more than Rs. 6700 crore to its employees during last four and a half years which was a record in itself, besides Government had also improved the service conditions of various categories of employees so as to benefit them. Chief Minister said that to benefit contractual employees various decisions had been taken. Some of the main decisions are, that contractual employees would be brought under National Health Insurance Scheme, Policy is being relaxed to provide employment on compassionate grounds to next kith and kin of the deceased employee. The next of kith and kin of the contractual employees would also be covered under this policy. Prof. Dhumal said that henceforth contractual employees would also be eligible for transfer, like regular employees, on completion of three years of service period. They have also been allowed 10 days annual medical leave in addition to 12 casual leaves being given to them earlier. Chief Minister said that now all contractual employees would be regularised on completion of 6 years of service instead of eight years period applicable earlier. He said that directives have been given to all administrative secretaries to implement the decisions in letter and spirit.